from Judith Vanistendael, When David Lost His Voice. (London: Self Made Hero Press, 2012). Comics and graphic narratives have grown in popularity over the past few decades, not just in the public but in academic writing and thinking as well. 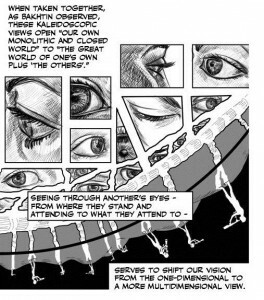 The recent publications of Comics & Media (Chute and Jagoda 2014), Graphic Medicine Manifesto, (Czerwiec, Williams, Squier, et al 2015) and Unflattening (Sousanis 2015) mark a new wave of critical texts that engage comics and the graphic form. 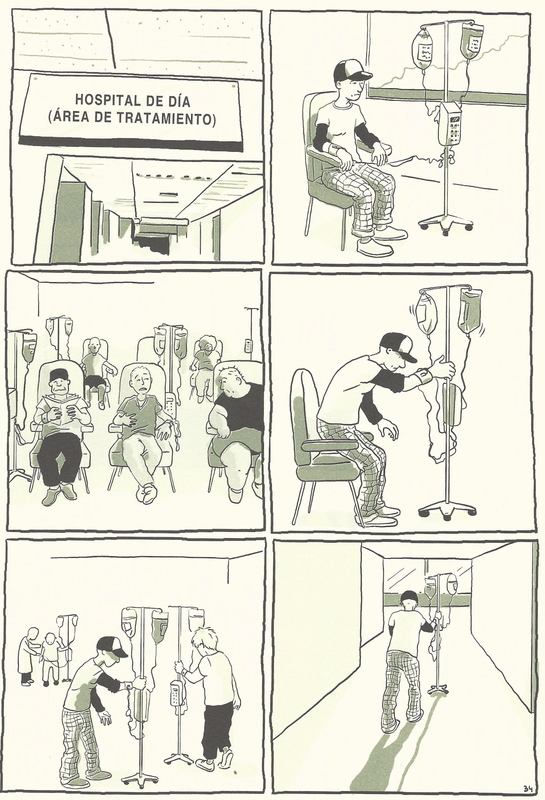 The Manifesto, in particular, highlights the growing number of graphic narratives about health, illness, and medical encounters—works that anthropologists would consider illness narratives. Recognizing the increasing number of illness graphic narratives, Ian Williams (physician, cartoonist, and medical humanities scholar) launched graphicmedicine.org. Artistic, academic, and medical interest in these works is culminating in what is becoming known as the field of Graphic Medicine. 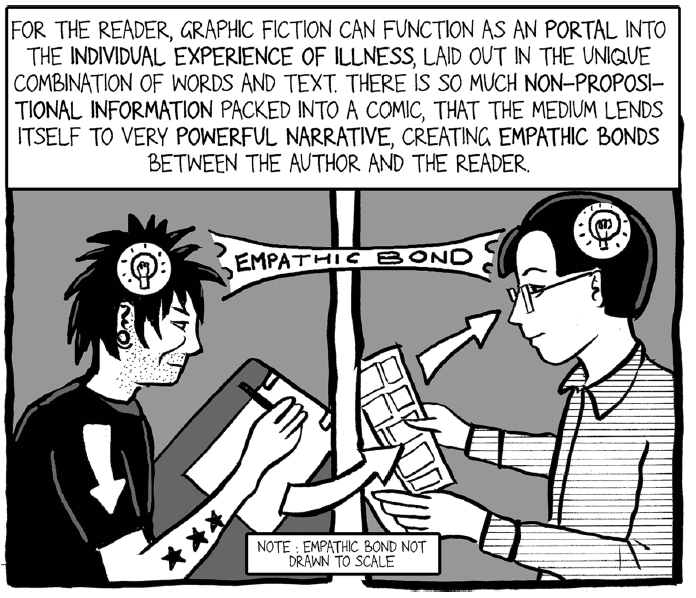 Graphic Medicine is a term coined by Ian Williams and is defined as “the role that comics can play in the study and delivery of healthcare.” As an interdisciplinary focus of study, these works raise a series of questions for medical anthropology, medical humanities, science and technology studies, ethnography, and ethnographic method more generally. This new Somatosphere series, Image + Text, seeks to engage the potentiality of graphic narratives as they contribute and transform ways of seeing. from Ian Williams, “Autography as Auto-Therapy: Psychic Pain and the Graphic Memoir.” Journal of Medical Humanities 2011; 32 (4): 353–366. Dana Walrath (2013) noted that “graphic medicine is a way of seeing the world through others’ eyes.” As a way of knowing and communicating about the world, comics and graphic narratives combine text and image such that the interaction creates a “double orientation”…a “looking in more than one direction at the same time” (Lewis 2001, quoted in Sousanis 2015:64). It is a way of seeing structure, complexity, nuance, emergence, and multiplicity simultaneously. From assemblages and rhizomes (Deleuze and Guattari 1987), to knots (Ingold 2015) and networks (Latour 2005), anthropologists continue to wrestle with how to convey the complexities of social worlds and emergent and multiple orientations toward human life. Despite our concern for finding non-hierarchical and non-linear forms of expression and ways of knowing, ethnographies are primarily a translation of experience into written, textual form (Mead 1995; Clifford 1983). We are caught in a kind of “problem closure” (Hajer 1995), wherein our tradition of text forecloses our escape of the hierarchical and linear in the conveyance of social worlds. Comics allow us to ask how we can “orient” ourselves (to borrow a formulation from Ahmed 2006) toward the potentiality of images and away from the systematizing effects of text alone. from Isabel Franc and Susana Martín, Alicia en un Mundo Real. (Barcelona: Norma Editorial, 2010). 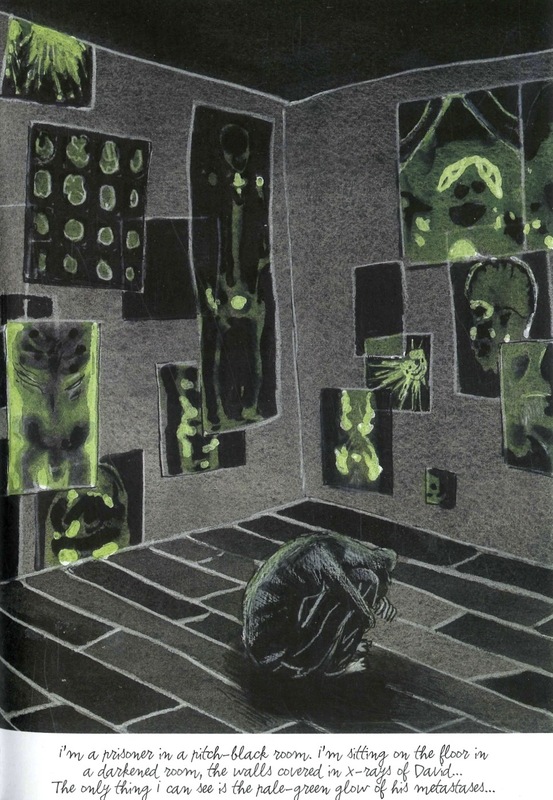 What are the conventions of comics such as attention to image and sequence, images and imagistic thinking as a way to see a different mode of existence, the role of gutters, and the embodiment of lines and drawing? Ethnographic drawing produces intriguing subjective and intersubjective moments wherein the drawing can be a self-reflexive moment for the artist. It can also be a moment where interlocutors readily and quite easily respond with memories and interactions upon seeing the drawing (Ramos 2004). Comics can coax an orientation toward interrogating theoretical concepts, the presence and absences of ways of knowing, and examinations of power relations in ordinary lived experience (Hamdy 2014; McMullin, in press). Comics are also particularly good at visualizing the mundane. Chronicles of daily interactions become meaningful as they are drawn and exemplified in the works of Alison Bechdel or Chris Ware. Thus this medium is well suited to address concerns that Povinelli (2010) raises regarding the “ordinary, chronic and cruddy” moments that lead to exhaustion or endurance in late liberal economies. The deployment of double orientations available to comics, the provocation of memories, connected imaginaries, communicating alternative perspectives, and an anthropology of the otherwise are precisely the concerns of anthropology, science, and medicine. from Nick Sousanis, Unflattening. (Harvard University Press, 2015). The Somatosphere series, Image + Text, will engage the landscape of graphic illness narratives. Posts will include book reviews and a series of essays that seek to create a critical dialog for a “graphic medical anthropology” (Hamdy 2014). While the conversation will be centered on the potential of comics in science, medicine, and anthropology, we want to examine the edges of that conversation by attending to ethnographic and illness narrative work that include image and text. We imagine this blog as not only analyzing images for their representational qualities, but rather considering what we can learn from the combination of text with image. We will consider questions of how we visually or imagistically (Stevenson 2014) tell other people’s stories. How we grapple with the methodological issues of what we see and record in the field, and what relations (human and non-human) need to be included to convey the “double orientation” of being immersed in the field. What can the production of comics and other graphic forms tell us about issues of embodiment, biopolitics, or biomedicalizaton? How do our relations of collaboration and translation as interlocutor, ethnographer/artist, or ethnographer and artist work to express subjective and intersubjective moments in complex social worlds that are fraught with illness and power relations embedded in a search for well-being? We invite submissions for this series from scholars and artists working in the social sciences and humanities of medicine, health, and science as well as from researchers and practitioners in the biosciences and medicine. If you would like to submit an essay or book review, please contact us with a short (250-500 word) proposal to julietm@ucr.edu. There is no strict deadline and submissions will be considered as they are received. Ahmed, Sara (2006). Queer Phenomenology: Orientations, Objects, Others. Durham: Duke University Press. Chute, Hillary and Patrick Jagoda (2014). Special Issue: Comics & Media, Critical Inquiry 40(3): 1-10. Deleuze, Gilles and Félix Guattari (1987) A Thousand Plateaus: Capitalism and Schizophrenia, Trans. Brian Massumi. London and New York: Continuum. Hajer, M.S. (1995). The Politics of Environmental Discourse: Ecological Modernization and the Policy Process. New York: Oxford Universiy Press. Hamdy, Sherine (2014). Top of the heap. Somatosphere http://somatosphere.net/2014/03/top-of-the-heap-sherine-hamdy.html (accessed March 27, 2014). Ingold, Tim (2015). The Life of Lines. New York: Routledge. Lewis, David (2001). Reading Contemporary Picturebooks: Picturing Text. Londong: Routledge Falmer. McMullin, Juliet (in press). “Cancer and the Comics: Graphic Narratives and Biolegitimate Lives.” Medical Anthropology Quarterly. doi: 10.1111/maq.12172. Mead, Margaret (1995). Visual Anthropology in a Discipline of Words. In Principles of Visual Anthropology. Paul Hockings, ed. Pp. 3–12. Berlin: Mouton de Gruyter. Povinelli, Elizabeth (2011). Economies of Abandonment: Social Belonging and Endurance in Late Liberalism. Durham: Duke University Press. Ramos, Manuel João (2004). “Drawing the lines. The limitations of intercultural ekphrasis.” Working images: visual research and representation in ethnography. S. Pink, L. Kürti, and A. I. Afonso (eds). Pp 147-156. London: Routledge. Sousanis, Nick (2015) Unflattening. MA: Harvard University Press. Stevenson, Lisa (2014). Life Beside Itself: Imagining Care in the Canadian Arctic. Berkeley: University of California Press. Taussig, Michael (2011). I Swear I Saw this: Drawings in Fieldwork Notebooks, Namely My Own. Chicago: University of Chicago Press. Walrath, Dana (2013). Aliceheimer’s: Alzheimer’s Through the Looking Glass. Armenia: Harvest Publishers. McMullin J, Pigg S. Image + Text – a new series. Somatosphere. 2015. Available at: http://somatosphere.net/2015/image-text-a-new-series.html/. Accessed April 25, 2019. McMullin, Juliet and Stacy Leigh Pigg. 2015. Image + Text – a new series. Somatosphere. http://somatosphere.net/2015/image-text-a-new-series.html/ (accessed April 25, 2019).